Solar Assist provides technologies and expertise to help you transition your home or business to clean & renewable solar energy. 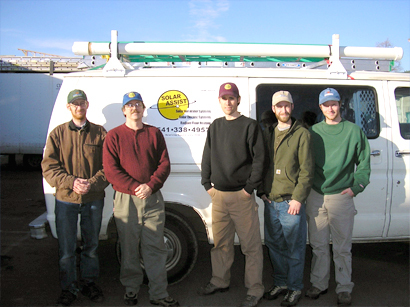 We’ve been serving the needs of western Oregon residences and businesses since 1994 and have thousands of quality projects and satisfied customers. We’ve been Oregon Department of Energy and EWEB approved for over 20 years, as well as many other local utilities in Lane County. We work with you to arrive at the best solution for your home or business’s energy needs, taking into account aesthetics, efficiency, financial and system performance, and durability. We frequently encourage customers to pursue efficiency measures before or during an installation of solar technologies to maximize their savings and minimize their environmental footprint. When you need energy efficient products and services that we don’t provide ourselves, we can usually direct you to a trusted business partner.